Innisfree Wheelers recently held their AGM in The Sligo Park Hotel and over fifty members attended. Chairman Alan Kelly, in his address thanked all members for their great perticipation in many events throughout the year. The club supported many local charities also with their own sportives and static cycle and Santa cycle. Outgoing Secretary, Violet McDermott, outlined all the various activities, sportives which the club were involved in throughout the year. It was an extremely busy year once again for this very active club. Treasurer John Connolly, in his report showed the club to be in a very healthy financial position. Violet McDermott stepped down from her very busy Secretaries post and she was thanked by the members for her very hard work during the entire year. 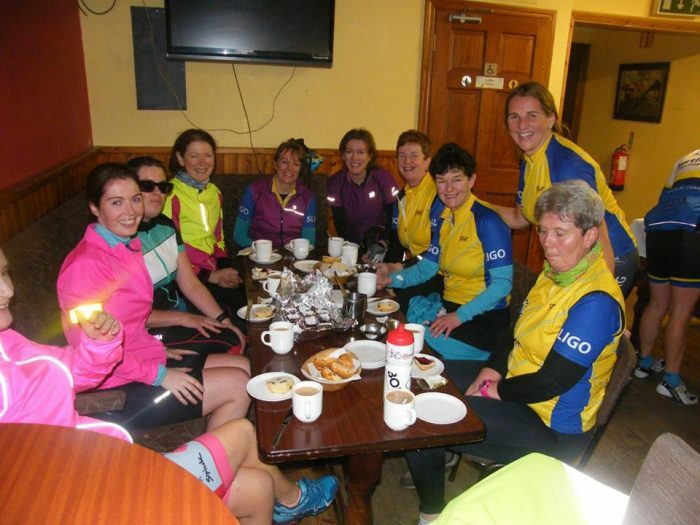 Caroline Brennan took over the reigns as Secretary for the coming year and no doubt Caroline will be equally busy as this is one of the most active cycling clubs – not just in Connaught, but in the entire country. Innisfree Wheelers members are active from 1st of January to 31st of December both on and off their bikes… for example Chairman Alan Kelly will probably clock close to 15,000 kilometres this year on the bike! – most people wouldn’t cover that distance in twelve months in their motor cars! The final three club events each year takes place in early December on the same weekend – which in itself presents quite a challenge. On Friday the 7th of December the Wheelers will let their hair down (those who still have some hair! ), and they will shed their lycra when they celebrate their annual Christmas Party in The Glasshouse Hotel in Sligo from 9pm. Here some festive music will see the energetic Wheelers take to the dance floor while others will be happy to watch on from the comfort of a bar stool or couch up on the first floor of The Glasshouse. Food bites will be provided to help the Wheelers to sustain their energies – as they usually carry their food in their back pockets on the bike. Dancing and mingling should continue well into the small hours. Then on Saturday morning, the 8th of December, despite some sore heads and wolly tummies, Innisfree Wheelers members will be in Quayside Shopping Centre from 11am until 5pm on two static turbo bikes peddling and collecting in aid if Sligo Lions Club Christmas Food Appeal. We have been associated with this very worthy local charity for a number of years and every cent collected on Saturday – and the proceeds from Sunday’s Santa Cycle go directly towards purchasing these food parcels for the poor families in Sligo. On Sunday the 9th of December at 11am, our annual Santa Cycle where all our members and friends dress up in Santa gear and cycle around Lough Gill (about 40km) for a great local cause. Sligo Lions Club Christmas Food Appeal is the deserving recipient from this fun event. Registration takes place at the Knocknarea Arena Sligo IT from 10am on the day and entry fee/donation is just €15 payable on the day. The cycle then starts at 11am and all Santa’s and Elves and an odd Moose or Turkey head off via Hazelwood and past the breath taking scenery at Parkes Castle and then everyone takes a welcom break in the quaint little village of Dromahair. Here Martina and her staff in The Blue Devon distribute ample food and hot drinks (tea and coffee only!). Then we all set off again and return to Sligo via Slish Wood and we re-assemble on Pearse Road before heading in convoy down town – much to the amusement of the many Christmas shoppers in the streets of Sligo. While some Santa’s head home then, most end up in Connolly’s Bar on Markievicz Road, where there is more food on offer and maybe a hot toddy if required. The event is open to all and all you need is a road worthy bike and a helmet to participate. The Santa Cycle brings the curtain down on our years activites – that is apart from the regular club spins at 9am and 10am on Sundays from IT Sligo and Tuesdays and Thursdays at 10am from Carraroe. Some members also like to gather at Carraroe for a short spin on St Stephens Day to burn of what remains of the Christmas Turkey. If you would like to join us in Innisfree Wheelers in 2019 then you are welcome to come along to any of those spins and meet up with us – you’ll find we are generally a friendly bunch.